In the past few months, I have read several times about the antibacterial, antiviral, and anti-fungal properties of honey and cinnamon. I am certainly not a doctor, but when I saw the idea from my friend, Justine, at Full Belly Sisters for a honey lollipop that was supposed to soothe a sore throat, I figured it was worth a try. If nothing else, it would taste good! Because of what I read, I added cinnamon to the lollipops. After making them, I let the kids and their friends sample the home remedy—they got good reviews in the taste department–then put the rest away for when the next cold struck. When my older son got the knock-out-drag-down flu recently, we put them to the test. He reported that the honey concoction soothed his sore throat and asked for them several times over the next few days. Whether it was truly an effective natural medicine or a placebo effect, we were both pleased with the results. For a child who is at least two years old, these would be a good alternative to a cough drop, which may pose a choking hazard. Conversely, you could make these as a cough drop, simply omitting the stick, for an adult or older child. If you end up with more lollipops than you need to sooth a sore throat, they will keep indefinitely stored in a cool, dry place and may also be used as a sweetener/stirrer in a cup of hot tea. I highly recommend making them in advance and having them on hand for the next time a soar throat strikes…and please let me know what you think! My yield was 13 lollipops, although this may vary somewhat depending on how large you make them. An inexpensive candy thermometer, available in most grocery and kitchen stores, makes these especially easy to prepare. 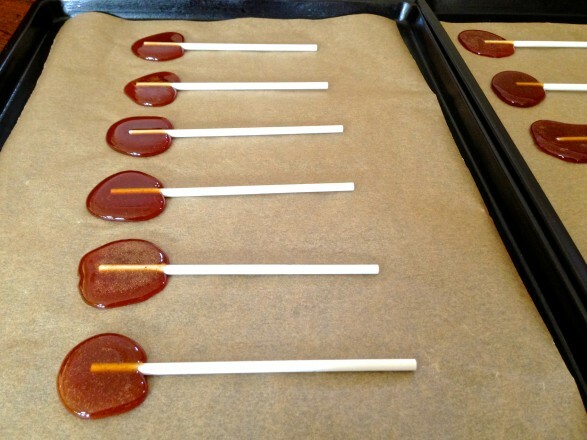 Lay the lollipop sticks on a parchment paper-covered baking sheet. Once the honey has reached 300 degrees F., remove the pan from the burner. Stir the honey and allow it to cool for a minute or two in the pan. Add the cinnamon, if using, and stir to thoroughly incorporate. Slowly pour the still-hot mixture over one end of the lollipop sticks. When the honey is very hot, it will spread out and form an uneven circle. Your first few lollipops might be thin and misshapen. As the honey cools, it becomes easier to pour an even circle. If desired, you may even out the first few lollipops by pouring a little more honey over them at the end. The thinner lollipops may be a little sharp around the edges once the honey hardened, so I would recommend making them thicker. Additionally, if your honey cools to the point that it becomes hard to pour, simply return to low heat for a minute or so to thin. Once completely cooled, wrap in clear, plastic treat bags and secure with a twist-tie or simply store in an air-tight container, separating the lollipops with a piece of wax or parchment paper. Note to parents with kids who have braces: As the lollipops are sucked on, the honey softens and, like taffy, would most likely not be orthodontist approved. 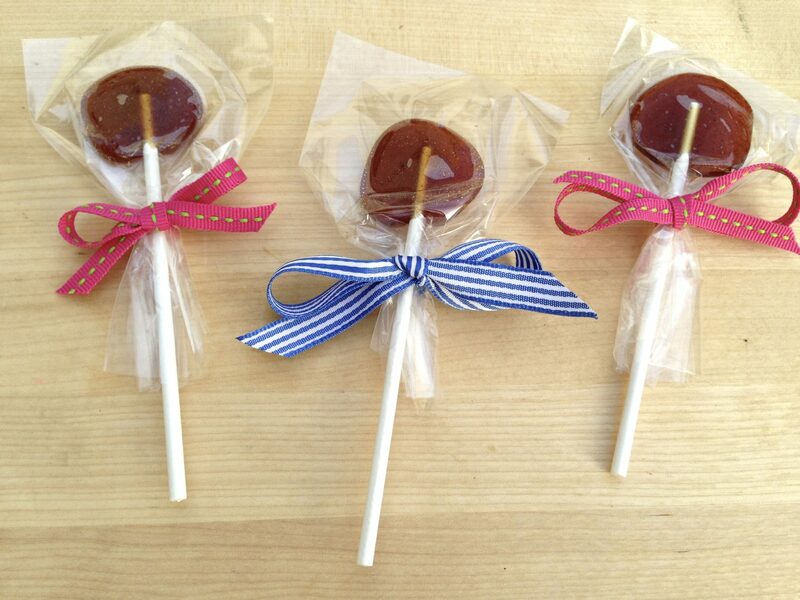 If your child likes tea, he or she could instead use the lollipop as a sweet stirrer in the tea. PS. Love the cute way you packaged yours! Technical glitch, Toni…my apologies! I think everything is in order now. I hope you like them! I came to this link Looking for the recipe for the honey cinnamon lollipops. Unfortunately I found no recipe included. How much honey and how much cinnamon? All the information is now there. There was an oops on my part and I was at church and just detected it! Sounds great, but where is the recipe? Thank you so much for including the recipe. These are going to be great for my young grandchildren. I hope they are helpful when an unwanted sore throat strikes. Thanks for the comment, Tammy! Ann, these are wonderful. I just wish I had these few weeks ago, but I am pinning it cause my kids get sore throat quite a bit 🙂 Thank you so much for sharing this. I was so happy I had these on hand when my son got sick. He really felt they helped. Coincidently, my pediatrician just cited a study that demonstrated honey lozenges effectiveness over all the other over-the-counter remedies! For those who cant see recipe its 1/3cup honey to 1/4 tsp cinnamon..im sooooo making these. Thank you, Christine…and I hope you find them helpful when needed! Thank you Ann for sharing these with me, I just made them with the honey and cinnamon, over cooked the first batch, used wax paper (they stick to wax paper), just made the second batch used parchment paper as suggested, waiting to cool and give them to my daughter, she has mono, since that is viral I used the cinnamon. Thank you sweetie!! Do you think these would work in a candy mold? Just for the purpose of having a fun shape? I was worried about getting them to “pop” out of the mold. I think they would work well, Heather. I wanted to make them without since some people don’t have molds. Just to be sure, you could very lightly grease the molds the first time. If you try, I would love to hear how you make out! how big is the finshed product? You can make them any size you like, Corinne. This batch was about 1 1/4 inches in diameter. These look great, but doesn’t heating the honey completely kill the enzymes that make it so healthful? I have read that most of the enzymes in honey are heat stable, yet that is why some people prefer to buy raw honey. Whether it is a placebo effect or a true remedy, honey in tea and as a throat lozenge does seem to have a positive effect! When using raw, organic (local) honey you must be careful when heating. Heating honey will kill the good bacteria fighting spores and reder it useless. Low heat, no boiling. I have been told when adding honey to tea/hot water for drinking to wait until the liquid is at a drinkable temperature so as not to kills all the good spores. So some adjustments may be needed to the rescipe. But it sounds yummy. Thanks very much for your comments, Zoe. I made a few comments regarding this in the comment above. Just to be sure, it might make sense to save raw honey for non-cooking purposes. If you try, I hope they help! So nice of you to weigh in, Carissa. Thank you…and so glad you are trying these! Yes, heating to 300 degrees F likely will render the properties of raw honey null and void. So don’t waste your money on raw honey for a recipe where you’re cooking it into hard candy. Save the expensive raw honey for using raw! It can be taken off a spoon if you want, and it can help with coughing and sore throats that way. But, having it in a hard-candy form is still useful. It’s great for soothing and moisturizing a sore throat, and in hard-candy form the advantage is that it lasts longer, to keep on soothing your throat. So keep both on hand! That’s a good question, Molly. I store mine in the fridge, and I’m trying to imagine what a higher degree of cold would do to the honey. If you try, please report back…and I hope they help your sore throat! I’m trying honey, cinnamon and apple cider vinegar on my itchy throat now …. hopefully it works! Have you tried adding ginger or licorice root to it? I know those two ingredients are known for soothing sore throats. Was wondering if you have information on if including those two additional additional ingredients would be safe for all ages. I have not added either to these lollipops but would love to know if you try. Fresh ginger may create a texture that some don’t care for. I have not used licorice root before. Perhaps if someone else tries they will comment as well. Easy to make and they made my kids feel better! Mine aren’t hardening. What am I doing wrong? Did you use a thermometer and cook until the temperature reached 300 degrees F.? Hi Ann, I cooked till 250 but felt like it was longer than 20mins so I stopped. Could that have been my issue? I think that’s it, Melanke. Maybe your burner heat just didn’t get the temperature up in that amount of time. You could try increasing the heat slightly the next time. The process of candy making is rather persnickety and really does rely on temperature. If you try again, let me know how you make out! Boiling honey above 95 degrees destroys it natural properties. I wouldn’t bother to use raw organic honey for this recipe for that reason. The soothing properties, however, when using regular honey are still helpful! I hope they help and everyone is feeling better soon! Nice and easy recipe . I would like to know if there is a natural substitute to making a sugar free lollipop. I have seen a lot of people recommend stevia and agave nectar which I believe is still not 100% percent organic. Do you have any suggestions that might be helpful ? Hi Shayan, That’s a great question, but in this recipe honey provides the bulk of the lollipop and offers the soothing qualities. Since it’s a powder, stevia wouldn’t have the right consistency. Agave nectar might work, but the amount of natural sugar in each pop would be pretty close. I hope that helps! How about xylitol. It’s natural and safe. I bake with it and have made puddings with it. So glad to read this, Julie! If you take 1 tablespoon of honey a day you probably could avoid the flu and other respiratory diseases ; I have. Great suggestion, Hope. There is so much evidence supporting the use of honey these days. Thanks for mentioning! Tried these twice, first time I didn’t measure the honey and wasn’t prepared for how much it boiled up then got scared of overflowing the pot and stopped. It wouldn’t get over 250°, needless to they didn’t harden so I left them in the freezer and used them for tea at work. I was looking for an more eco-friendly way to add honey to my tea. In the end I was sort of happy with the result but unhappy with the small plastic bag waste I was then producing with each one. My second time around, used a larger pot and measured half a cup of honey and… Success! They were a lovely deep golden color and the smell was significantly different as they neared 300°, fyi. Wrapped them with the parchment paper I made them on after they firmed up. They are perfect! I’m so happy, thank you so much! I’m so glad you gave them a second try, Elena. As you found out, reaching that 300 degree threshold is key. Thanks so much for sharing your feedback, and enjoy those lollipops! I am going to try this recipe! But I might try adding some lemon to it! Sounds wonderful, Denise. I’d love to know what you think! When I make my honey candy it seems hard but when I put in in the plastic bag it sticks to the side. Any ideas please on what might help. Hi Debbie, Some of the natural stickiness does remain and but will be less apparent when the honey is cold. I sometimes store these in the refrigerator for that reason. Also, some wrappers work better than others, so if you’ve been using plastic bags, you could try wrapping them in parchment or wax paper instead. I hope this helps! How do you keep from burning the honey at 300 degrees? Every attempt I’ve done hasn’t worked, suckers twisted and smell burnt. Any tips? If you have further questions, let me know, but hopefully this will help!